In thousands of cultures, in millions of different iterations, the protective charm exists. If you recall, we touched briefly on how the pentagram is one when it is turned into a Seal of Solomon. Like how I referenced a previous article? Yeah, I’m slick like that. This month we’re talking to the hand, the Hand of Fatima or Hamesh Hand that is. 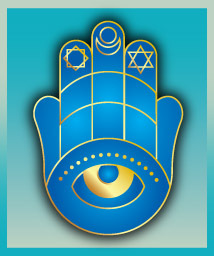 It goes by many names, Hamsa, Khamsa, Hand of Fatima, Eye of Fatima, Hamesh Hand, Protective Hand, or Hand of God. No matter what name it goes by its appearance is a very basic one. It’s a hand, either fingers up or down, in a stylized version, with three fingers up and a shorter finger on each end. In the center of the palm is an eye. Sometimes they’re very basic, just like I described, but often there is ornate etching embellishing the design. The hand, when referred to as the Hand of Fatima or Eye of Fatima, is drawing on it’s Islamic origins. Fatima is the daughter of Muhammed. Many say the five fingers represent the Five Pillars of Islam. When the hand is called the Hamesh Hand, or Hand of Miriam, they’re referencing its Jewish origins. Miriam is the sister of Moses. Some say the five fingers represent the five books of the Torah. Oddly enough, each faith views the hand as exclusively theirs, never acknowledging the remarkable similarities. No matter the origins, this hand protects against the evil eye. It can be found painted on homes, worn as an amulet, carved into plaques, used as a key chain, and in a myriad of other ways. This hand is your all purpose protection against evil.